University of California San Diego pitcher Justin Donatella, 24, has been promoted to the Triple-A level in the Arizona Diamondbacks organization–putting him just one step away from the big show. Thursday’s announcement from UCSD came just hours before Donatella’s Triple-A debut for the Reno Aces of the Pacific Coast League, where he recorded his first Triple-A strikeout in the first inning against Albuquerque. With his promotion, the 2015 National Collegiate Baseball Writers Association National Pitcher of the Year and unanimous NCAA Division II All-American is one level away from Major League Baseball. Some recent Tritons to appear in Triple-A have been fellow right-handed pitchers Tim Shibuya in 2017 and Guido Knudson in 2016, and infielder Vance Albitz in 2014. Knudson is the most recent former UC San Diego standout to earn an MLB call-up, making four relief appearances for the Detroit Tigers in 2015. 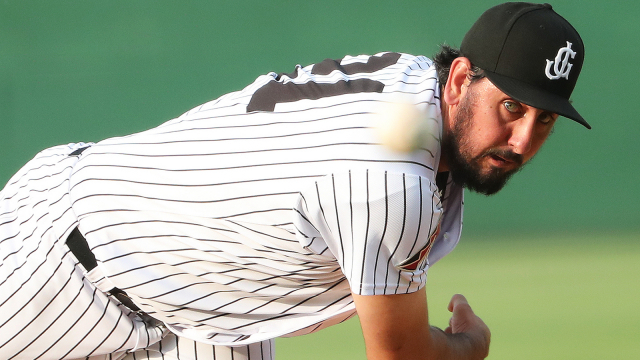 Donatella, a 6-foot 6-inch tall right-hander, completed the 2018 season at Double-A Jackson, helping the Generals to the Southern League title. He was the Diamondbacks’ 15th-round selection during the 2015 MLB First-Year Player Draft, at No. 436 overall. He signed his first professional contract on June 18, 2015, forgoing his fourth and final season of college eligibility as a Triton. He’s since gone through the MLB’s ranks in a bid to the pros, first through the minor leagues and now Triple-A.